If you’re after an acoustic with a little vintage country flair, then look no further than this G5022CE Rancher – oozing retro appeal, it’s unmistakably Gretsch. With plenty of influence from the original 6022 Rancher released in 1954, this modern day electro-acoustic has made its way onto our chart covering the best acoustics under $500. So, why all the fuss? 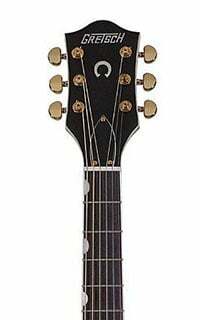 The G5022CE Rancher features a jumbo body with a 25” scale length, and a deep Venetian cutaway. It has a solid spruce top, with scalloped X-bracing, while the back and sides are constructed from laminated flamed maple. Moving up and you’ll find a glossy mahogany neck with a rosewood fretboard, containing 21 frets cut to a vintage size. As a standard guitar this package would be very desirable, but then you move on to the distinctive style points which take it to a whole new level of retro. First there’s the striking dark orange gloss finish (referred to by Gretsch as ‘Savannah Sunset’) that envelops the whole body and neck. You also have the distinctive Rancher triangular sound hole, some cool neoclassic thumbnail inlays running up the neck, and a 1940s-style tortoiseshell pickguard with the iconic Gretsch logo. Overall it’s a striking guitar, that feels robust and comfortable to play. This electro-acoustic comes fitted with Fishman Isys III preamp system with a Sonicore undersaddle pickup, allowing you to plug in via the 1/4 jack and amplify your sound. The controls on this system are pretty simple – just master volume, bass and treble controls, with a phase switch for reliable feedback control. There’s also the handy built-in digital tuner, which is very useful for stage playing. Aside from the electronics, the G5022CE Rancher sports a rosewood bridge with compensated synthetic bone saddle, deluxe die-cast tuners which are gold plated for that extra touch of vintage class, a self-lubricating Delrin nut, and a set of light D’Addario EJ16 Phosphor Bronze strings. The only thing missing is a case. If you’re looking for a bright and twangy sound then you’ve come to the right place. The G5022CE is crisp, vibrant and articulate – perfect for fingerstyle and slide guitar. It does lack a little low end, and – like the original 6022 Rancher – it could be a little louder acoustically, especially when you consider the size of the thing. However this is not a problem when plugged in, and proves a handy ally when playing on stage. Gretsch is the go-to brand when it comes to buying an instrument with genuine retro charm, and the G5022CE Rancher really impresses when it comes to its style, construction and playability. While it could have been a bit bassier, the overall sound is very suitable for a wide range of music styles, and the electronics make it sound good through an amp. For more info about the Gretsch G5022CE Rancher, click here. 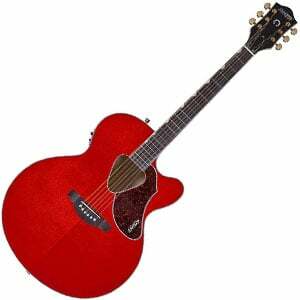 For more acoustic guitar under $500 you might like, click here.